We had our carpets cleaned and I had to clear out my sewing room. When we started putting it back together it was a good chance to do some purging and rearranging. Here is the new and improved room. My little helper had to get in on the photo too. Looks so neat and tidy, now get in there and mess it up! 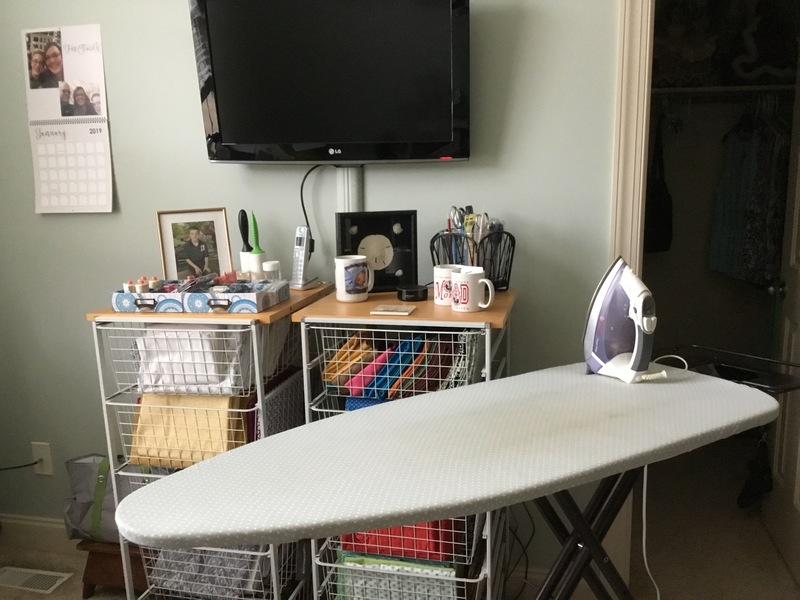 Isn't it nice to have a clean, organized space in which to work? And I love your helper! What a pretty face. Awesome room! It looks so nice and organized and inviting. Your little helper looks like good company. What a wonderful time to take the opportunity that was open to tweek and clean and organize. I bet you can't wait to settle in and create! Aah, so organized and tidy. Do you just walk in there and admire it with a grin on your face? Ooooo, that looks so inviting! And I love your kitty! I love your hutch! I have the same one that is dark green with dark wood in my living room. Ours is used for china. Your room looks so nice and tidy. Kitty is a cutie! You have a lot more snow than Minnesota. 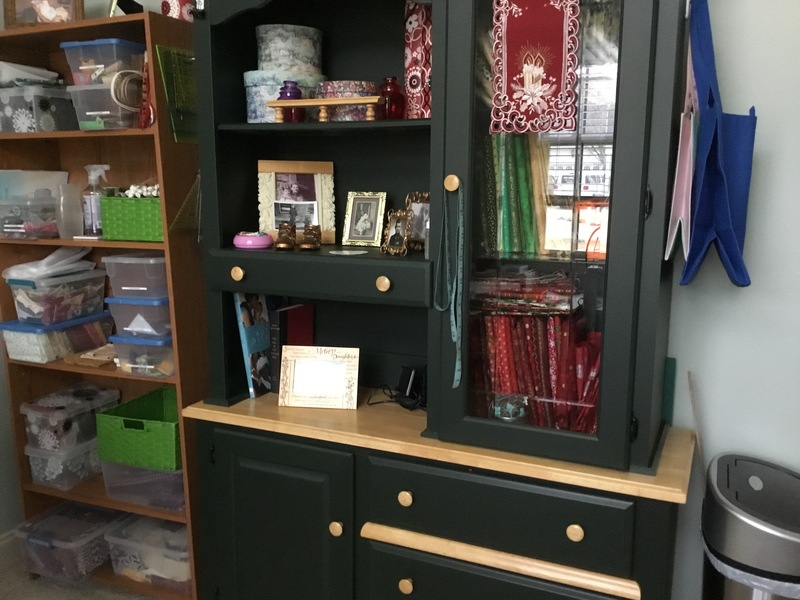 Lovely sewing room! I am envious. Mine is a gigantic mess! You must be in the NC mountains to get that beautiful snow. We were promised some of that white stiff here in the Piedmont, but it looks like rain only.... cold, cold rain! Doesn’t it feel nice to have a clean room? I find it very motivating to start a project when everything is tidy and its proper place. 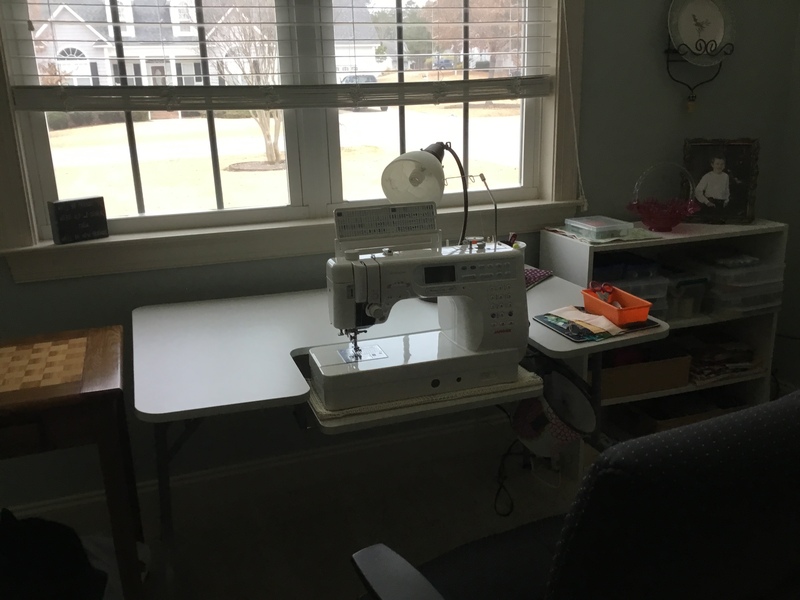 Nice sewing space. Nice room. Everybody needs a little helper. Nice! 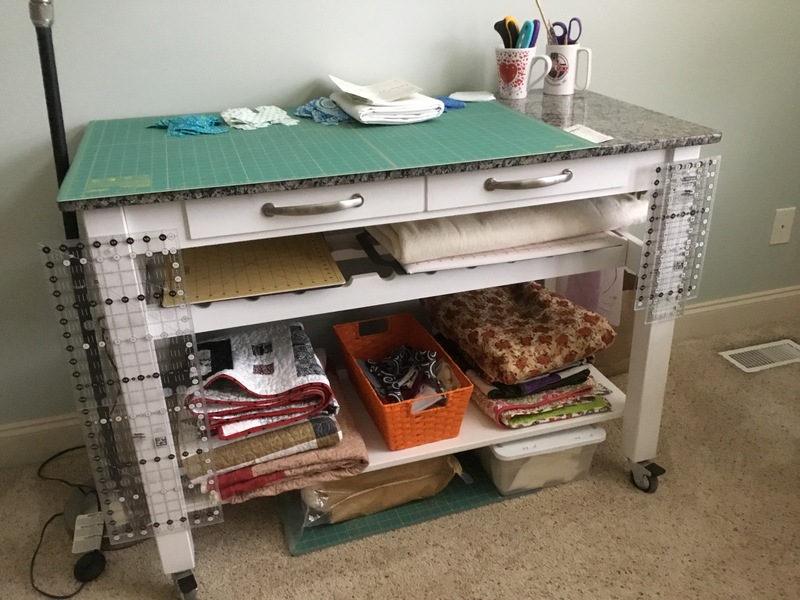 May i ask if you bought your cutting table -- the one with 2 drawers, casters, and the green mat on top -- and if so, where you got it? I'm cutting on my dining room table, and oh, my back! I'd love a table like yours that is a reasonable size and I could move easily, if necessary. Wow! Wonderful work space. Great tools. Wonderful window to provide light. Sweet helper. 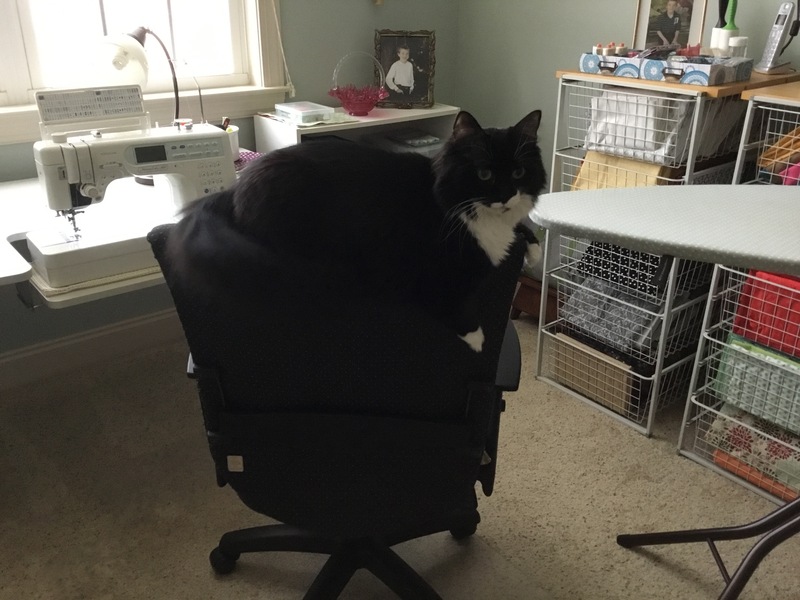 You have a super set-up and your sweet "little" helper...well, that's quite a cat! Enjoy the clean room! Looks like a wonderful space to sew in. That looks so inviting and comes complete with a sweet kitty. I am desperately trying to keep my room neater by cleaning after I get a top done. It makes such a difference when it is neat and tidy. Where did you get the cabinets with the wire baskets? I could use about 4 of them. 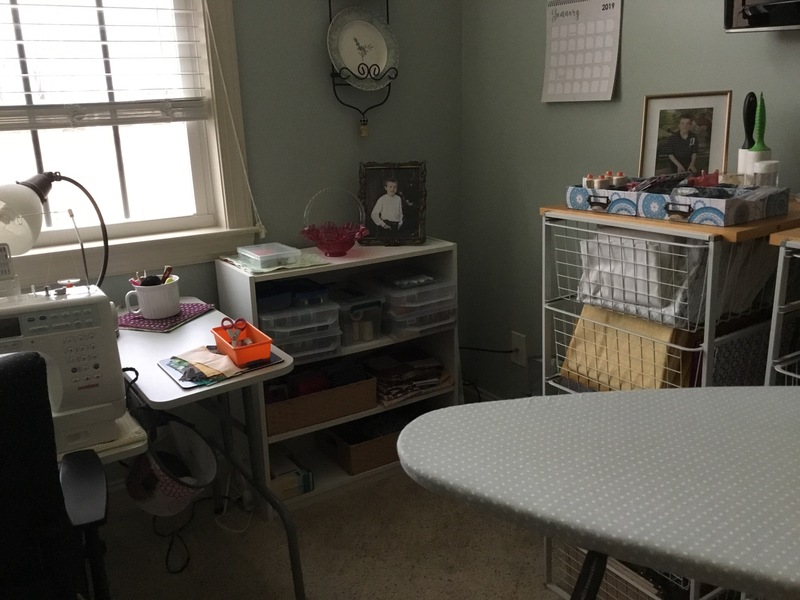 Your sewing room looks so nice. I am sure it was fun to just get all organized and purge some of the items you will not need. Good start for 2019. Your room looks great....... but i don't see a kitty anywhere. Looks great - such a blessing to have a designated space in your home. Great job!!!
. It is a portable island that we bought at Lowe’s home improvement, we used it in our old house but when we moved the new kitchen has an island in it. It is the perfect height for me and I am about 5 foot 4 inches. They may not have this any more but I know they do have some. they came from Lowe’s home improvement but the last time I was there they did not have them in the store anymore. They are about 10 years old.